Make unsupported assertions based on his cherry pick. 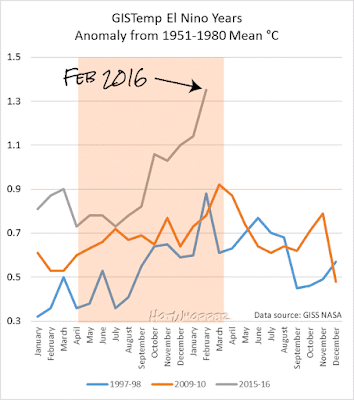 Sea surface height anomalies from 2014 and hottest ever 2015? 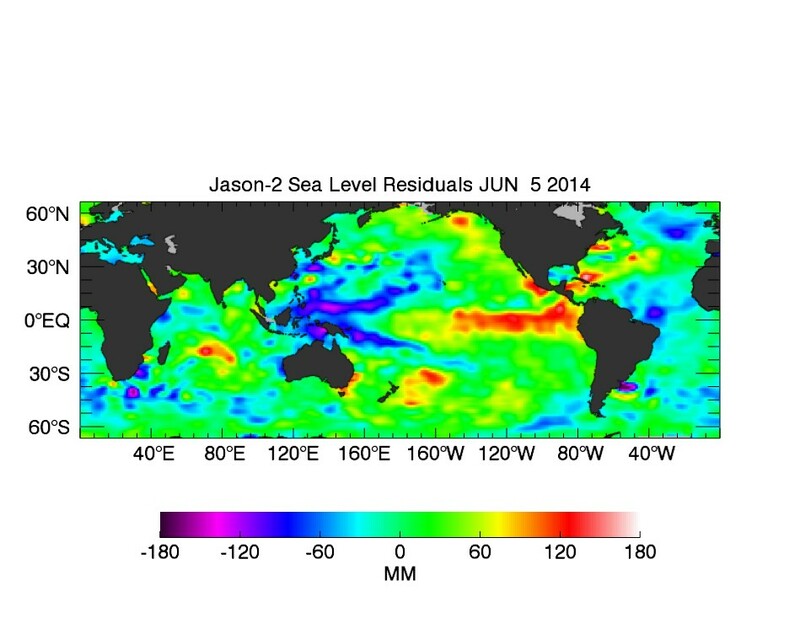 Figure 3 | Sea surface height anomaly as at 5 June 2014. Source: WUWT that got it from another article at WUWT that got it from the Jason2 website of NASA's Jet Propulsion Laboratory. Dr Ryan Maue of Weatherbell follows the data, wherever that data leads him. He’s not shy of telling it like it is. Yesterday he released what I consider the most important graph of the year. There are some things you'll notice about his map. First of all there is no information about what it represents.. Finally it's not of the whole world. It doesn't include the Arctic or Antarctic. If Anthony wanted his readers to be informed by that map, then he should have said something about it. I expect he didn't because he didn't know anything about it. He just thought it looked pretty or something. Anthony initially put up the image below, when he first wrote the article. It was labeled GWPF, and as far as I know, Ryan Maue doesn't have an association with the lobby group the GWPF, which agitates for the world to get hotter and hotter faster and faster. Anthony didn't explain anything about that chart either or why he posted it, or why he swapped it out for the image of June 2014 sea level. It turns out that this was also a map of sea surface height. It was a still from a rather silly GWPF youtube video, which included a segment the GWPF filched from NASA. 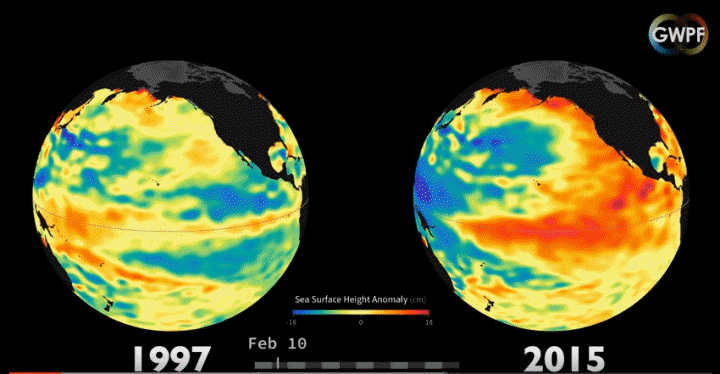 Below is the still from the same date from the NASA animation, which looks a bit cleaner than the GWPF video. 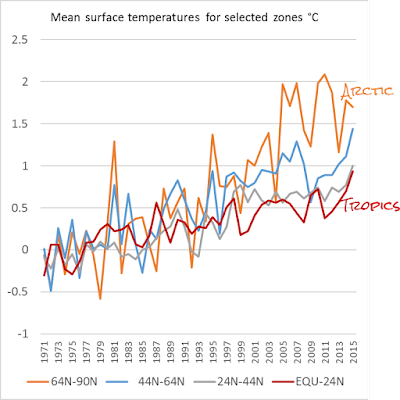 Figure 5 | Origin of Figure 4 above, comparing the sea surface height anomaly ion 19 February 1997 with that on 19 February 2015. Source: Animation on NASA's website. The point is that neither Anthony's new image nor his GWPF YouTube still was of surface temperature. Not the surface temperature of the sea and certainly not the surface temperature of land. Both his maps were of sea surface height anomalies on a particular date. 19 February 2015 in the case of his GWPF YouTube still, and 5 June 2014 in the case of the image he substituted. 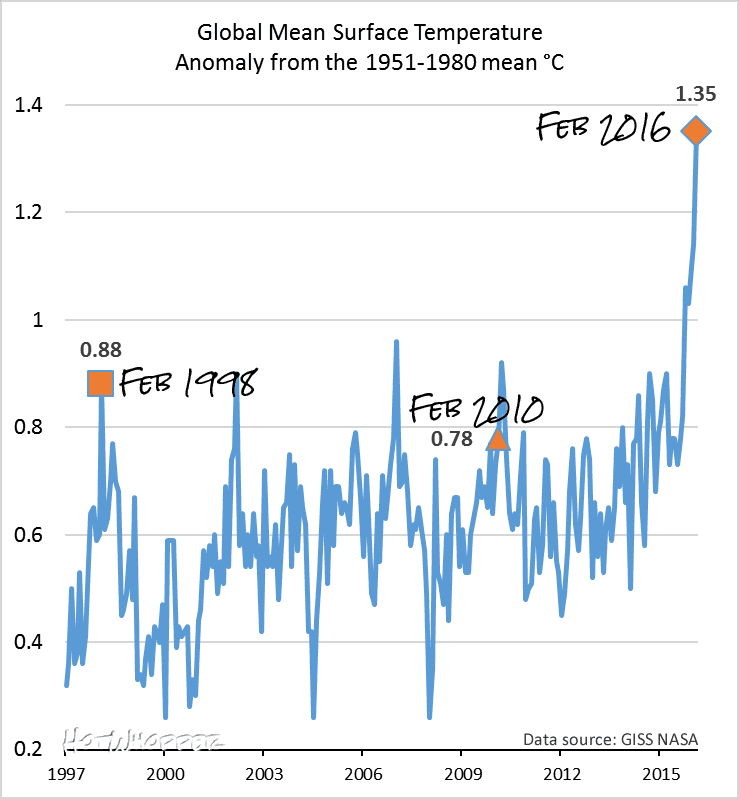 For all those people that want to claim 2015/2016 “proves” that human caused global warming is at work (while at the same time ignoring a record El Niño event as seen above), this graph indisputably proves that the El Niño is the driver of record high temperatures, not carbon dioxide. Do you know anyone who claimed that 2015/16 "proves" that human caused global warming is at work? I don't. I cannot imagine anyone would. The evidence that humans are causing global warming lies in the long term warming, not a single hot year. For his so-called "evidence", Anthony triumphantly pastes a tweet from Ryan Maue, which doesn't claim (or show) what Anthony claims it claims. 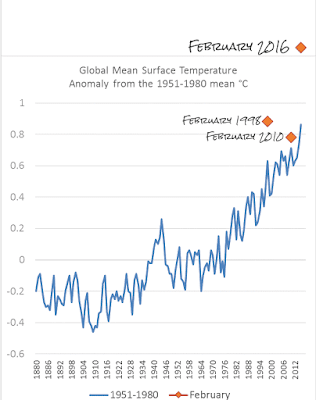 Globally it got progressively hotter in the hottest respective months on record - October 2015 to February 2016 inclusive. I think this is a much starker view of what's been happening on a monthly basis. However monthly plots are very noisy. Annual charts remove the seasonal fluctuations. 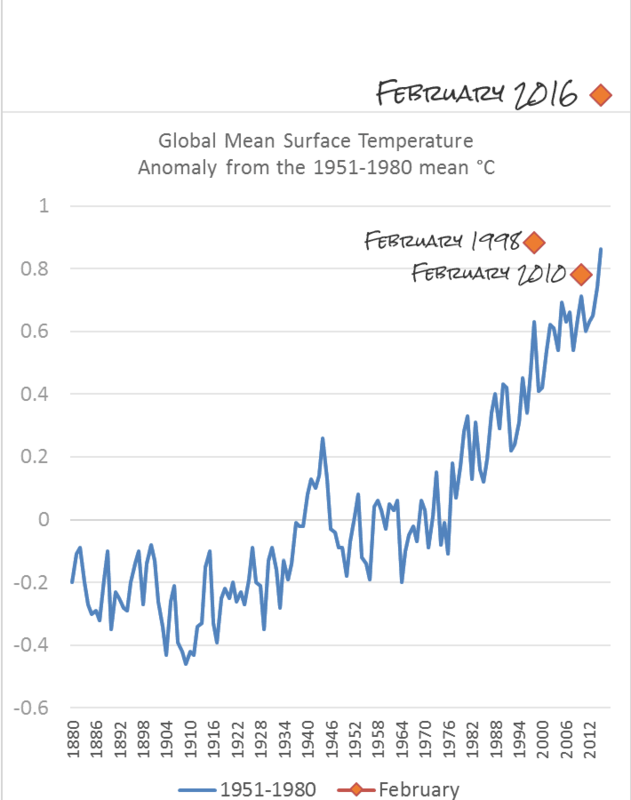 The chart below shows the annual temperature with February in recent El Niño years added - February 2016 is off the chart. February 1998 was also hotter than any annual average so you mustn't make too much of a single month. What it does show, however, is that the world as a whole is getting a whole lot hotter and it's not just ENSO magically causing the world to heat up. Where is it warming? It's the high northern latitudes! As you can see in the Northern Hemisphere the temperatures have been going up most in the Arctic and sub-Arctic, more than the tropics and latitudes closest to the tropics. To really appreciate the difference between north and south, look at the scale on the Y axis of the above charts. The Arctic has hit more than 2C above the 1951-1980 mean. What Anthony Watts has done is called cherry-picking. First he showed maps of sea height level anomalies from 5 June 2014. Wrong year, not surface temperature and it didn't include the Arctic. Then he showed a chart that only had the tropics and global mean surface temperature. It didn't include other latitudes so it wasn't sufficient to demonstrate anything except that both the world as a whole and the tropics have been getting warmer in the past few months. ,,,he was wrong. It didn't prove anything at all. In fact El Niño wasn't responsible for all the warming last year. Much of it was from anomalous warmth in the high northern latitudes. ...this graph indisputably proves that the El Niño is the driver of record high temperatures, not carbon dioxide. ... he was wrong. That chart didn't "indisputably" prove anything at all. It was just a chart. It didn't include temperatures for any other regions. If he'd included monthly temperatures for other latitudes, the chart may have been more informative. He didn't, so it wasn't. Bob Tisdale has been busy over the past two years arguing that the 97/98 El Nino was the biggest ever. He's been trying to show that it was stronger than the current one. If that's the case then it can't be El Nino alone that caused these past few months to be the hottest on record, can it. Deniers need to get their story straight. The GWPF ‘Sea Surface Height Anomaly’ picture is kind’a misleading. Yes, I replaced it with a better representation of the 2015 ENSO event. It’s worth noting that it is showing sea surface height, not temperature. and it is May 21, 2014, from here. But, but, El Niño was super fueled by evil fossil fuels!! It is unprecedented since the last big one on record and there could not have been any as big in the past where we do not have records, the tree rings prove this. I am sorry, with this scam any and all excuses, no matter how far fetched they are, are fair game it seems. Tomeb. 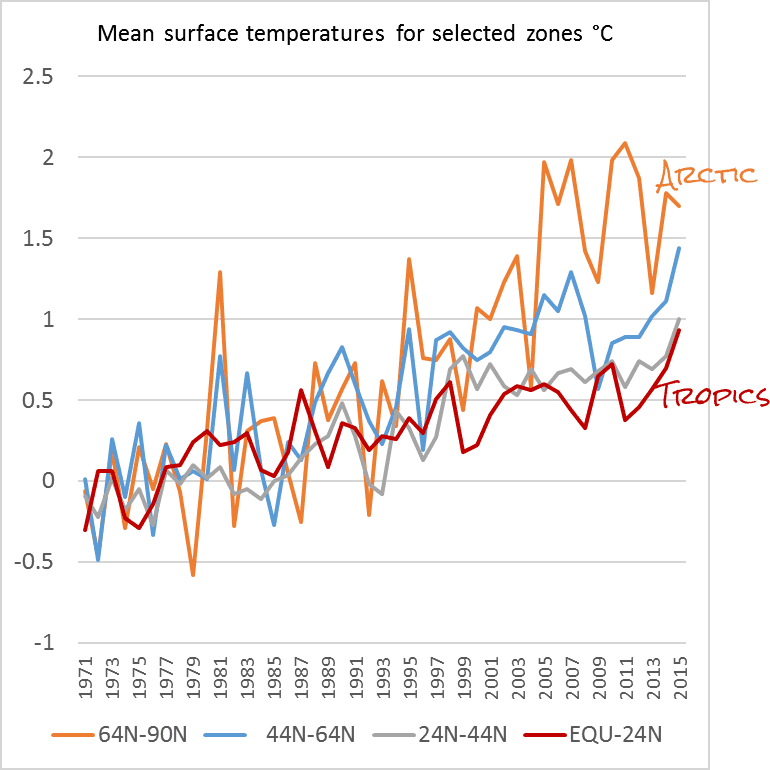 Please look closely at your posted WMO melange of three underlying ‘adjusted’ records. Ignore the OLS lines. NO warming from 1950 to ~1976. 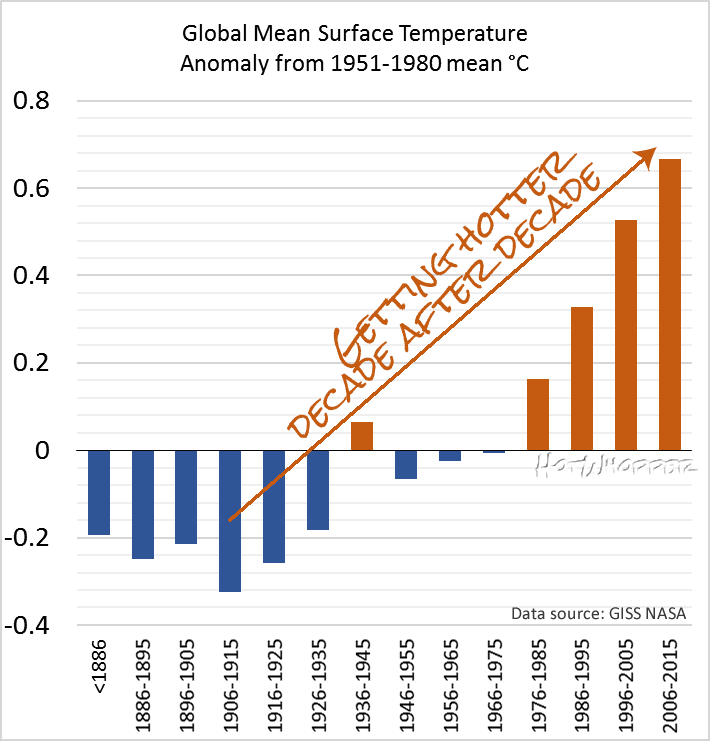 Clear warming from ~1976 to ~1998. NO warming since. Natural Variation is evident, since CO2 was monotonocally increasing the entire time (proven by the MLO Keeling curve starting 1957 IIRC). So OLS is inapplicable. Now realize that the CMIP5 archive was, by peer reviewed ‘experimental design’ parameter tuned to best hindcast from YE 2005 back 30 years to 1975. A problem that resulted in model failure to predict the now ~19 year pause, resulting in model falsification. They failed because of their parameter attribution problem, which you have so nicely (if inadvertently) illustrated here. Previous guest post had the why and how. Sheesh there is some weird nonsense posted at WUWT. pochas94 thinks a whole heap of wrong, including the fact that he doesn't know that CO2 is a well-mixed greenhouse gas and is the same over Antarctica as in the air over the rest of the world, such as Mauna Loa. Because the antho CO2 never makes it to the antarctic. Contrary to the myth that CO2 persists in the atmosphere for hundreds or thousands of years, its lifetime is actually less than a year. In winter plant life goes dormant so that anthropogenic CO2 has persistence and there is a definite elevation of CO2 in the arctic which, in the absence of water vapor, produces the warming effect. In summer plants become active and the surplus disappears. Since there is little CO2 generated in the southern hemisphere and it is mostly ocean anyway, the southern hemisphere does not experience this effect. 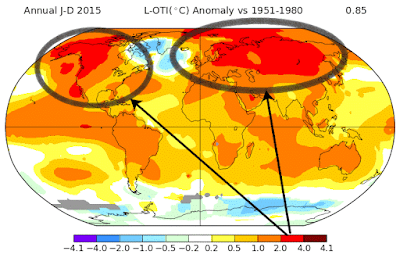 So “global warming” is largely confined to the arctic in winter and some to the northern extratropics. The tropics are affected by El Niño of course, but the southern extratropics do not experience “global warming” simply because there is no wintertime elevation of CO2. 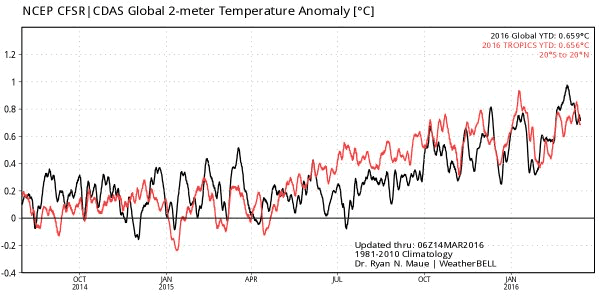 By focusing on April-October you missed the most important point, the temperatures are above the 30 yr mean for almost the entire year for both the tropics and the entire globe. That is the AGW signal. Luke, you are one of those guys who claim that wet sidewalks cause rain. If Mark had said that wet sidewalks were a signal it had probably rained, his analogy would have been closer to the mark. The globe warms naturally, the globe cools naturally. What makes you think the baseline for natural warming/cooling is a flat line? Why can’t it be an upward sloping baseline? The Warmists argue that they can’t explain the warming without CO2. But they can’t explain the warming from the 1910s to 1940s, with or without co2. Their inability to explain natural phenomena does not prove co2 to be responsible for anything. This blog entry is a brilliant textbook example of a straw man coupled with a red herring. No one actually believes the things you’ve set off to disprove. It’s entertaining, though. The record high temperatures we’re experiencing now are the result of a very strong el Nino piled on top of the heating due to AGW. Neither one alone would currently result in the record high temperatures we are seeing. No one has claimed the 2015 and 2016 records are due solely to AGW. 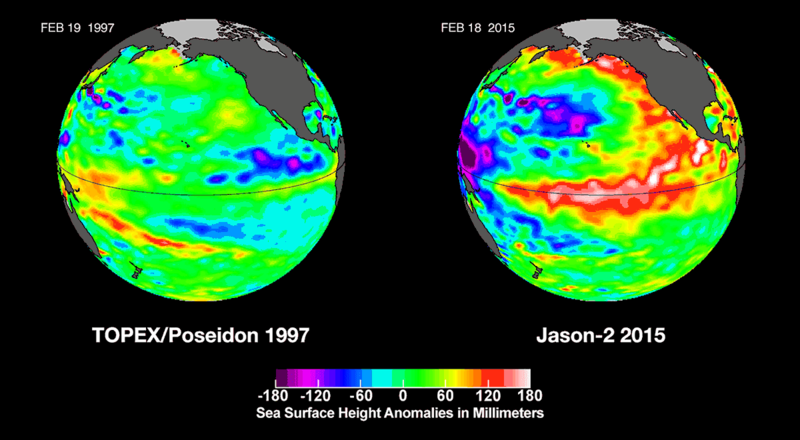 So the attempt to prove el Nino is involved is silly at best, since everyone is agreed on that already. Nor does anyone say the record 2015 and 2016 temperatures “prove” the reality of AGW. Physics and chemistry prove the reality of AGW. The consistent long-term trendine is a symptom of (not a “proof” of) the physics behind climate science. The record-high temperatures of 2016 and 2016 are a result of a strong el Nino sitting on top of the high level to which the long-term trendine has brought us. Some more meaningful questions: How long has it been since there was a record low global monthly or yearly temperature? How many global monthly or yearly record highs have there been since then? What does that tell you? I notice at least some WUWT readers are beginning to acknowledge that the Earth is warming (which is a start) though they continue to question the cause. At least ya’all are moving in the right direction. The comment by dcpetterson is the same in different words to the one I (Toneb) posted higher up the WUWT thread. Istvan's comment that Sue has quoted is his reply to me. I haven't even read it - as it would send me down the rabbit-hole in a rage - and I've learned (not always successfully) to resist. Going by some of the comments, Tony, I think some deniers get a lot more enraged by scientific facts than any normal person does when deniers do all they can to speed up warming. Deniers typically process science with emotion not reason. Read Harvard's take on Santer's "at least 17 years". He's so wrong words fail; it's hilarious. 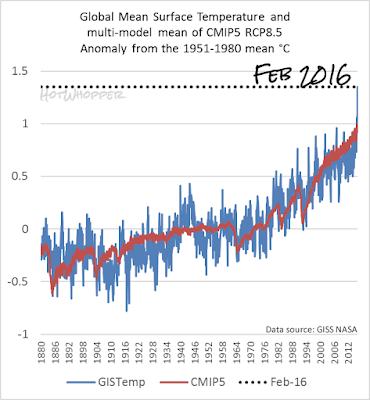 There's a good article at The Conversation about the February spike in surface temperatures. I have a simple way to filter out those who have no idea what they are talking about - such as Ktm who can't write CO2 correctly. How many science classes must you have slept through not to know how to write simple chemical formulae? Well, to be strictly correct the "2" needs to be subscripted, but still. The inability to write a simple chemical formula or abbreviation correctly (e.g. co2, Co2, C02, PH, Ph, etc.) probably has a strong correlation with a commenter's general incompetence regarding the topic at hand. But sometimes it's just a typo. There are a number of numeric subscripts and superscripts in the Unicode character set, and one can write CO₂ by using the subscript 2, but it's generally more trouble than it's worth for a blog comment. I know the subscripts can be a problem, but writing lower case (e.g. co2) is a red flag to me. I'm happy with CO2, as subscripts sometimes don't work. I also agree with Magma re pH - the H is capitalised because it is hydrogen. Aha. Usually more than one way to skin a cat with HTML, as Magma shows. I think it's by using the unicode character 8322 to produce the subscripted 2 rather than the 'sub' tag. Let me try here: CO₂. It is not AGW because ... 2014 sea levels. Seems as if WUWT and other AGW deniers are still looking for that magic bullet, that elusive single needle in the haystack that will bring the entire scientific consensus crashing down in ruins. Given the apparent over-representation of engineers among 'skeptics', I wonder if that lack of insight into scientific and technical matters carries over to their day jobs. Skeptical engineer: I've *run* the numbers. Given the tensile strength of the steel available at the time, there's NO way the Golden Gate Bridge could support its own weight, let alone traffic and wind loads. It's a hoax, probably just another socialist tax grab. 'Pretty definitive, in my opinion." 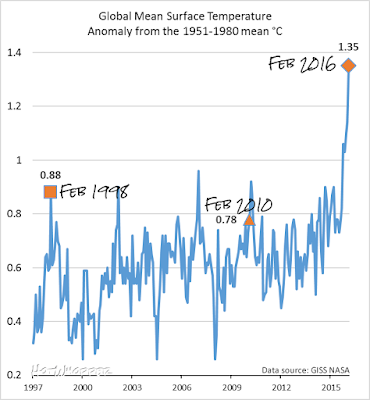 "this graph indisputably proves that the El Niño is the driver of record high temperatures, not carbon dioxide." I also had some comments about "settled science". Tony's head is going to explode when he is informed that S.M. has posted here...life is good! Sou, being mentioned in your article is almost as satisfying as being referenced in a footnote. Thanks. Toneb and a couple of others are doing a smash-up job at WUWT being rational and informative and responding to the crazy. I know we won't have an effect, but at least it hones some writing and web research skills, and encourages the virtue of patience. "Nick Stokes found it somewhere else on WUWT - it's from Jason2 and is of sea level, not temperature:"
Meanwhile, my comments at WUWT now go to spam, and haven't been re-emerging. I see that the gracious host accepted your observation with his usual charm. And it’s worth noting that your comment is pointless, since the graph was replaced. But it’s typical Stokes. That would mark a real turning point at WUWT, Nick. I guess we'll have to wait to see if it's permanent or just a temporary dummy spit (like deleting Steve Mosher's comment).